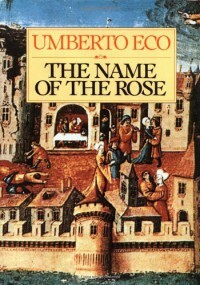 Because Umberto Eco demonstrates a remarkable knowledge of 14th-century (and earlier) ecclesiastical history, one might suspect him to be a student of the subject, or rather, the dean of a college of religious history. Or, and this seems more likely, an 800-year old biographer who finally got around to putting his early experiences down in writing 30 or so years ago. Unfortunately, in truth, he was a medieval history professor before being convinced to write historical, monk-centered murder stories set in the middle ages. Take heart, though, that despite the disappointing fact that he is not eight centuries old, this description is probably a significant oversimplification. Because I lack a similarly vast understanding of 14th century Churchology (I KNOW it's not a word, but understand anyway!) in all its fascinating minutiae, the book made itself a challenge to read in some places. This is not the fault of the story, but, as Ezra Pound might have said, of the reader for being too ignorant to understand it. I certainly fit that bill in some respects, though, as with many great books, this one was an avenue to further my education. And, where once I might have been led to my trusty 1960s era encyclopedia set (so old it was spelled encyclopaedia--a point that cost me dearly in a grade-school spelling contest), an iPad Wikipedia application served to bolster and clarify. The historical fiction is one that, when done effectively, I enjoy a great deal. In the past year I've started reading [a:Gore Vidal|5657|Gore Vidal|http://d202m5krfqbpi5.cloudfront.net/authors/1344345289p2/5657.jpg]'s novels, and the experience has been delightful and rich for someone accustomed to more straightforward historical books. I enjoy these stories (for the same reason I enjoy historical works, minus the fictional narrative) largely because of the informational safari the process of reading becomes, leading from one research point to a hundred others, along an interweaving web of educational adventure. Anyone who has experienced the fission reaction that is opening a dictionary to find the meaning of a word, only to be led to another word, and on and on until you run out of fingers to serve as placeholders, will understand the kind of digressive undertaking it can become. And Huzzah for that! Eco's main Sherlock Holmsian character William of Baskerville says as much himself: "Often books speak of books." As does the narrator of the tale, the novice monk Adso: "Now I realized that not infrequently books speak of books: it is as if they spoke among themselves." With that in mind, you may want to consider having some form of resource on hand, though it's possible to bull through without it. (It may also help to be fluent in Latin or, at the very least, have an understanding of one of the romance languages, because there's a lot of untranslated Latin.) Fortunately, Eco manages to inject enough intrigue into the story amidst an ocean of detail that I was able to come away feeling I'd read a story rather than bumbled into a food fight betwixt historians and emerged feeling dirty and stupid. Ultimately, my complaints are few and ridiculous. The characters of the monks grew rapidly tiresome as conversationalists, often because they felt compelled to try and bend every explanation or dialogue into a demonstration of God manifest in the world (which was the point--a point I'll get to...). This made conversing with them exhausting. (... now.) Amusingly enough, it becomes clear before long that these monks are something of a contradiction, for all their pontification. And this is the tension, apart from the murders and the library labyrinth, that drives the story. Here we have God-devoted monks trying to eschew the world around them, yet their purpose is to preserve knowledge of the world, of philosophers, of the secular world, and in many cases, the heathen world (as they reprinted many Islamic texts as well). While material wealth is coveted, ironically, by the monks of the monastery, so is intellectual wealth. And this particular abbey has an Erebor-like hoard of books. It would not be an exaggeration to say the book ends with Smaug descending from the skies, driving the monks away, and heaping all the books into a monstrous pile and falling asleep for a decade. Feel free to use these final two sentences as the springboard for your Lord of the Rings/The Name of the Rose mashup, spinoff fiction. Eco is a savvy writer and recognizes their attempts to maintain a virtuous shroud, and it's apparent the protagonist felt the same way. I felt the corner of my mouth pull up whenever William offered a short, dismissive platitude in an effort to end some rambling speech about how God Made Such And Such or interjections of humble thanks for some arbitrary blessing and get them back to the subject of his investigation or to add something substantive to a philosophical argument (arguing philosophy with the devout is itself exasperating, considering how easy it is to dismiss rational thought in a world overseen by an omnipotent overlord and thus removing the need for thought altogether). The monks' attitudes are understandable, but speaking to them with the intention of gathering information was like wading through swamplands in sponge boots. At the same time, and this may not be to the liking of more devout readers, the book is written from a secular angle. Yes, the main characters are all religious as is the narrator, but the monks are very human in their vanities and vices--some of which are decidedly and mortifyingly anti-Christian doctrine. In the end, the story was definitely interesting from a plotting perspective. A series of murders in a 14th century monastery surrounding a secret library and solved by a Former Inquisitor Turned Thinking Monk? Pretty neat. Yet the biggest takeaway from this story is the experience of going back to, what seems to me, a vivid and historically accurate experience of religious life in the 1300s, filled with religious proprieties and all its contradictions in the face of the secular Renaissance as it gathered steam, peppered with observations that set intellectuals and religious at odds and strengthened humankind as a provider for itself of technology to sever the need for a giving God, and as the religious battled the countless schisms and interpretations of Christianity as opposed to the belief of the general populace that Christianity has always existed as it is, uncontested and unadulterated. This isn't so much a story as it is an experience. If you're in the mood for an experience, I encourage you to have this one.